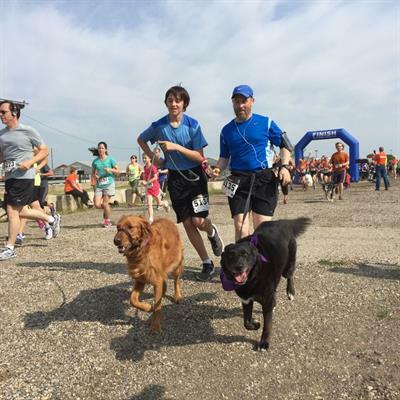 This family-friendly, dog-friendly event will take place on Saturday, May 18 at the Jefferson County Fair Park. 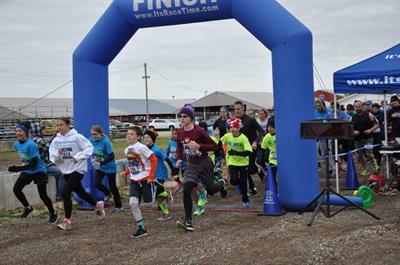 Over 500 runners and walkers and nearly 200 dogs participated in last year's FF5K, with crowds of enthusiastic spectators cheering them on. 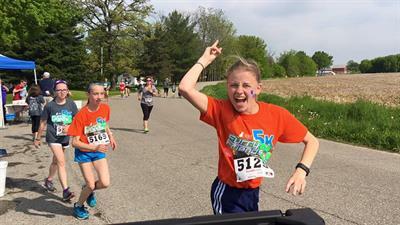 Thanks in large part to FF5K creator Nora Wichman and many generous sponsors, the Furry Friends 5K has raised in excess of $150,000.00 to benefit lost, homeless, and abused animals in Jefferson County and beyond. Sponsors receive a great deal of publicity through advertisements, press releases, social media platforms, and other forms of event promotion including t-shirts and posters. There are several different sponsorship levels available and all sponsorships are tax deductible. Sponsors will be rewarded with advertising opportunities that that reach the counties of Dane, Dodge, Jefferson, Milwaukee, Rock, Sauk, Waukesha, Walworth, and beyond. 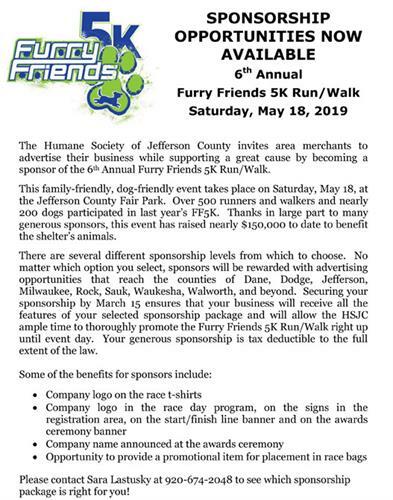 Securing sponsorships by March 15 ensures that businesses will receive all the features of their selected sponsorship package and will allow the Humane Society ample opportunity to thoroughly promote the Furry Friends 5K right up until event day. The Humane Society of Jefferson County has proudly served the community for ninety-six years. It is a private, non-profit 501 (c) (3) corporation and receives no governmental funding. 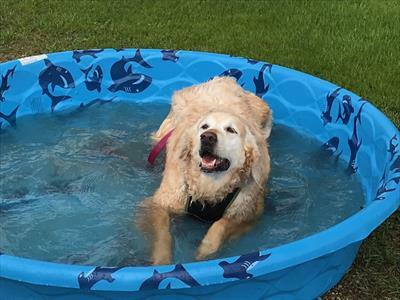 In addition to reuniting lost pets with their owners, the HSJC provides pet adoption, 24 hour stray animal pick up, low cost rabies vaccination and microchip clinics, a safe keep program, humane education classes, pet therapy visits, and a Furry Friends Kids Camp. These services are offered in the hope of creating a more informed, compassionate, and humane community. Business owners who would like to support a worthy cause are encouraged to contact Sara Lastusky at 920-674-2048 to see which sponsorship level is right for you.